Coral genomic data compiled in this study and their attributes. 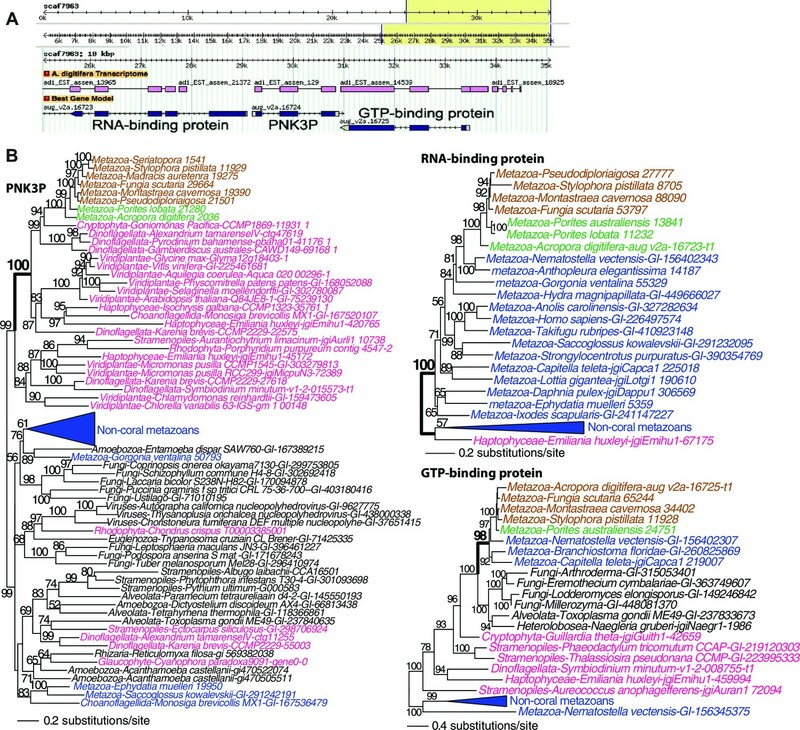 Major components of the human ion trafficking system identified in the coral genomic data. Bayesian consensus trees of SLC26. Bayesian posterior probabilities are indicated when greater than 50%. 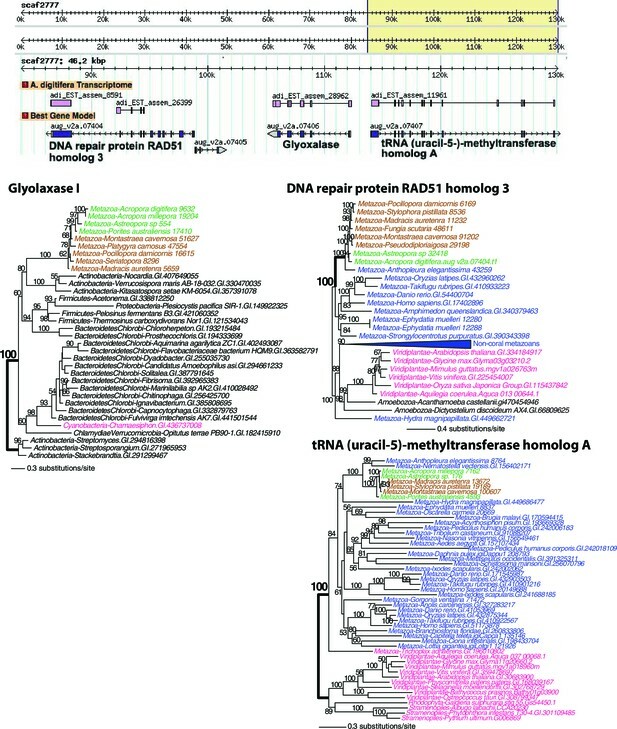 For this analysis and for the trees shown in Figure 2—figure supplements 2–4, MrBayes v3.1.2 was used with a random starting tree and the LG model of amino acid substitution. Trees were generated for 6,000,000 generations and sampled every 1000 generations with four chains to obtain the consensus tree and to determine the posterior probabilities at the internal nodes. 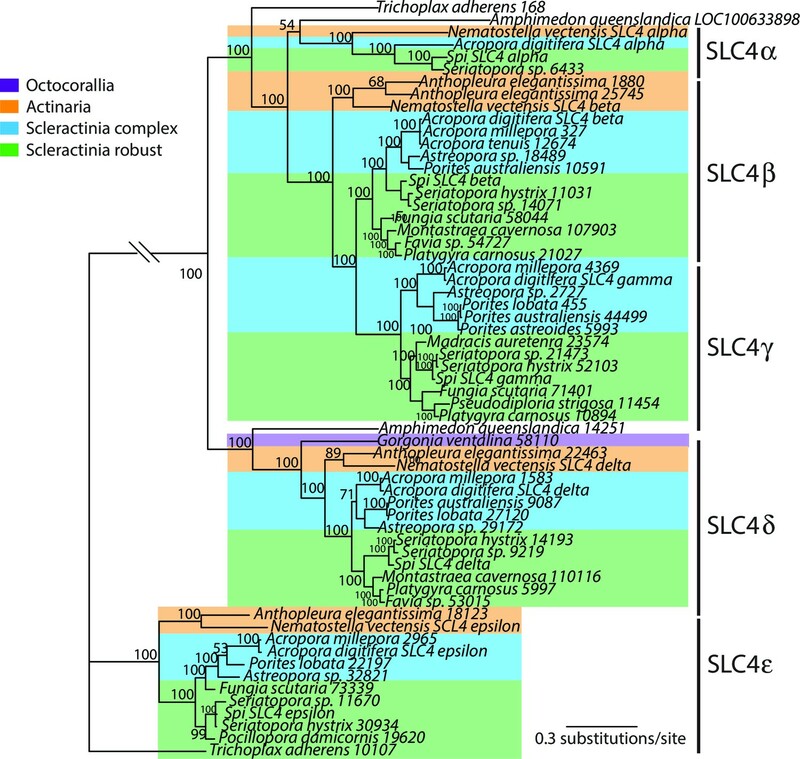 Bayesian consensus trees of SLC4. Bayesian posterior probabilities (×100) are indicated when greater than 50%. Bayesian consensus trees of Cav. 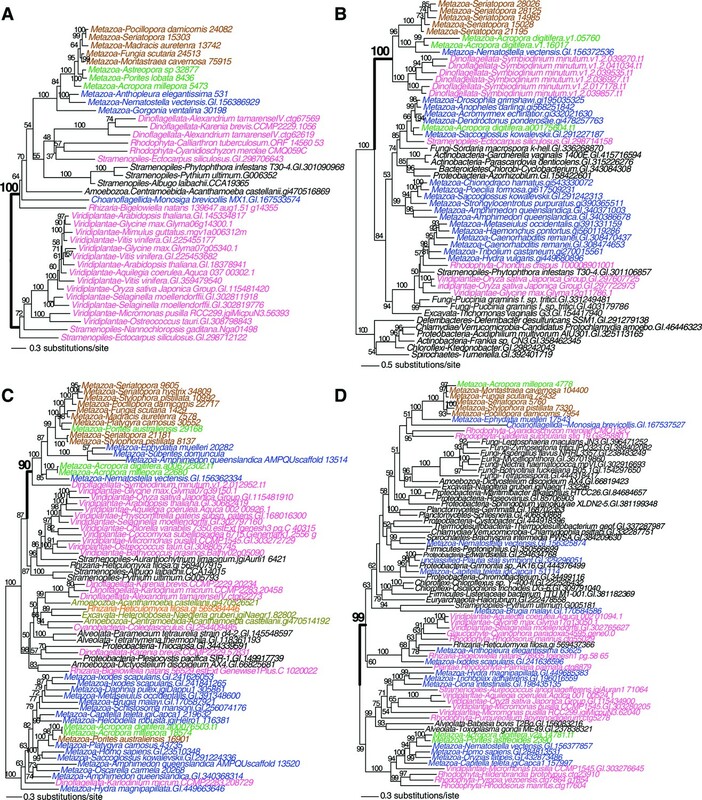 Bayesian consensus trees of coral and outgroup Ca-ATPase proteins. 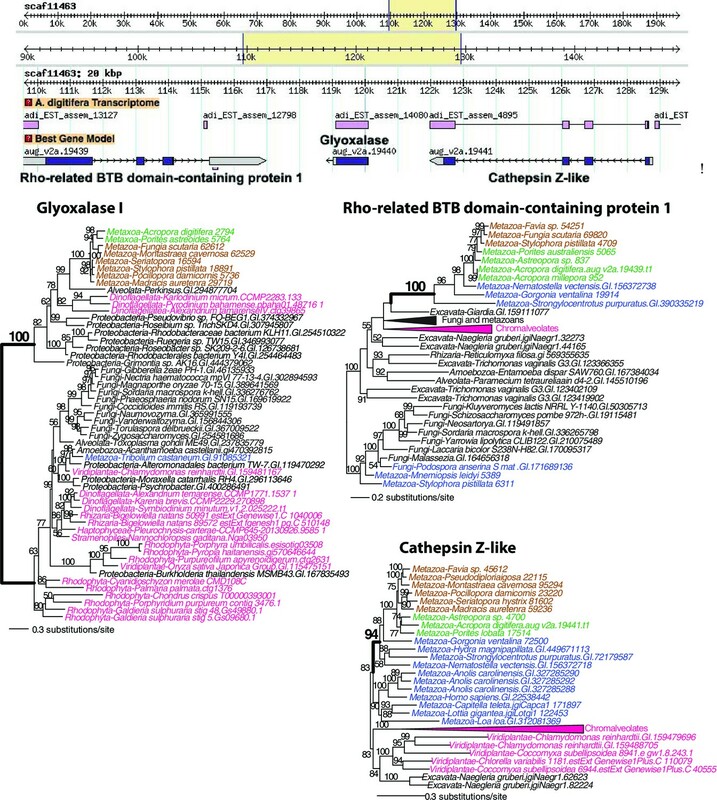 Evolution of CARPs and other coral acid-rich proteins. (A) Maximum likelihood (RAxML) tree showing extensive history of duplication of genes encoding CARP 5 that predates the split of robust (brown text) and complex (green text) corals. (B) RAxML tree showing the origin of CARP 1 in robust (brown text) and complex (green text) corals from a reticulocalbin-like ancestor by the evolution of a novel acid-rich N-terminaldomain. The non-coral species in both trees are shown in blue text. Scatter plot of isoelectric points of collagens from Seriatopora, Stylophora, Nematostella, and Crassostrea gigas. Maximum likelihood (ML) trees of galaxin and amgalaxin. 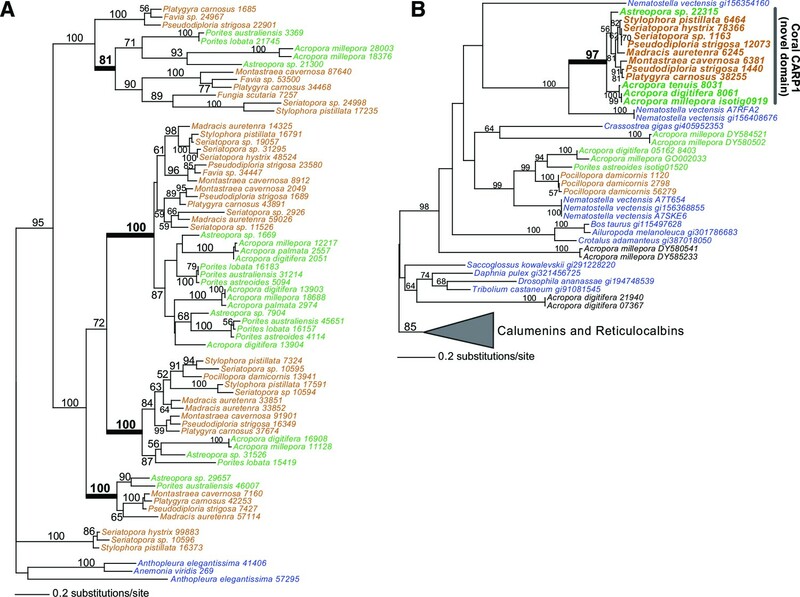 (A) ML tree of best galaxin hits from 19 coral species (brown for robust corals and green for complex corals) and 11 non-coral species (blue text). 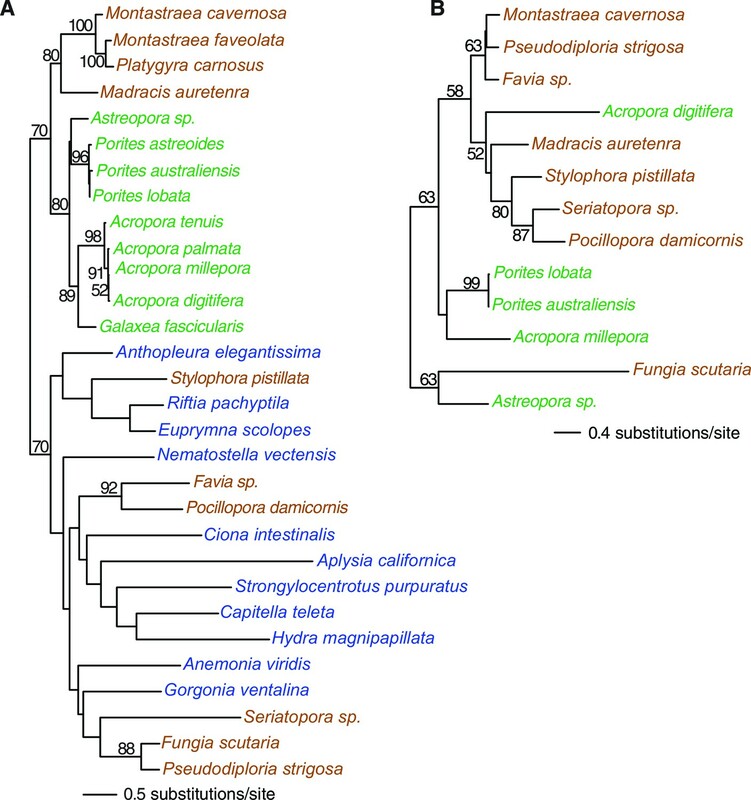 (B) ML tree of best amgalaxin hits from 13 coral species. 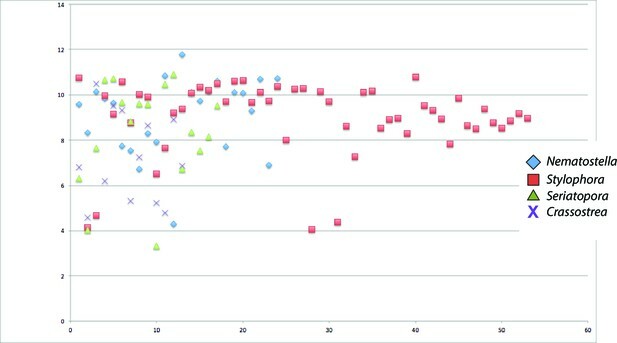 No outgroup blast hits were found against the acidic region of Acropora millepora amgalaxin 1 or 2 (Genbank accession numbers ADI50284.1 and ADI50285.1, respectively). 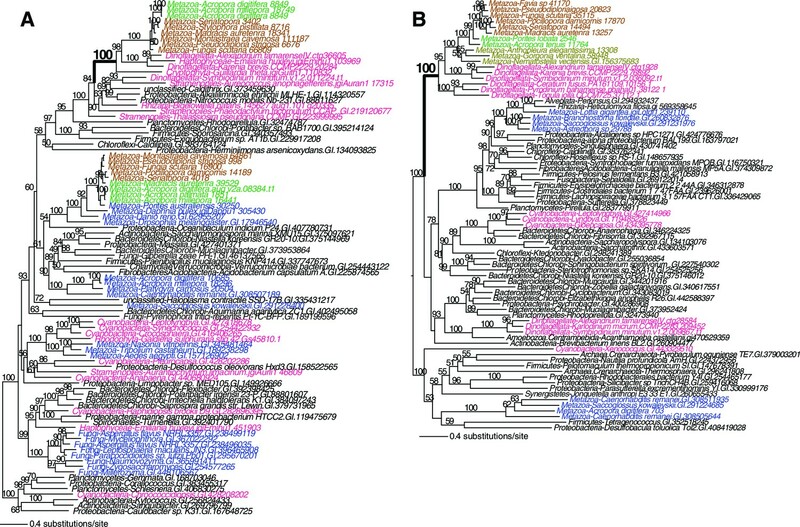 Maximum likelihood trees of a DEAD-like helicase and the protein encoded by the flanking gene. The bacterium-derived DEAD-like helicase genes in coral are nested within bacterial sequences, whereas the upstream host-derived gene (encoding mannosyl-oligosaccharide 1,2-alpha-mannosidase IB) is monophyletic with homologous genes from other metazoan species. 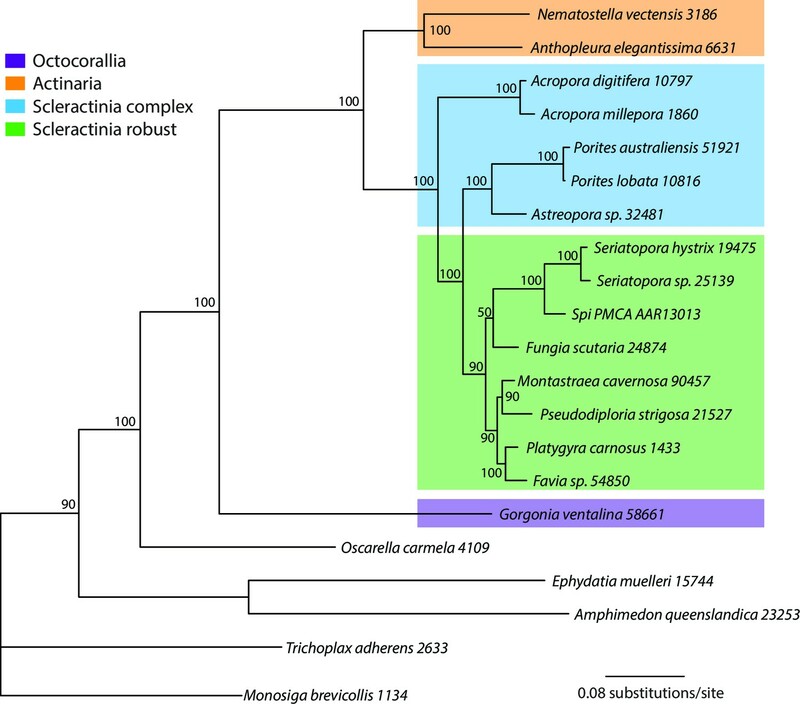 The downstream Acropora digitifera-specific gene has no detectable homolog in other species. 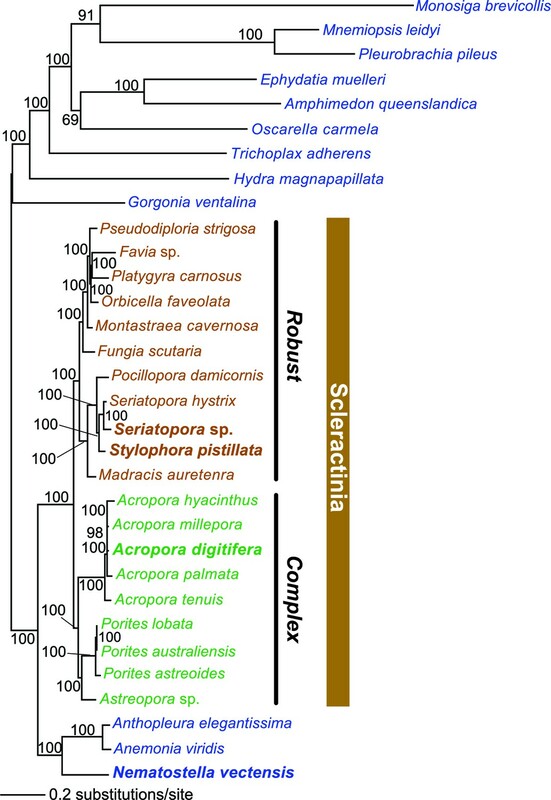 Robust and complex corals are shown in brown and green text, respectively, and non-coral metazoan and choanoflagellate species are shown in blue text. 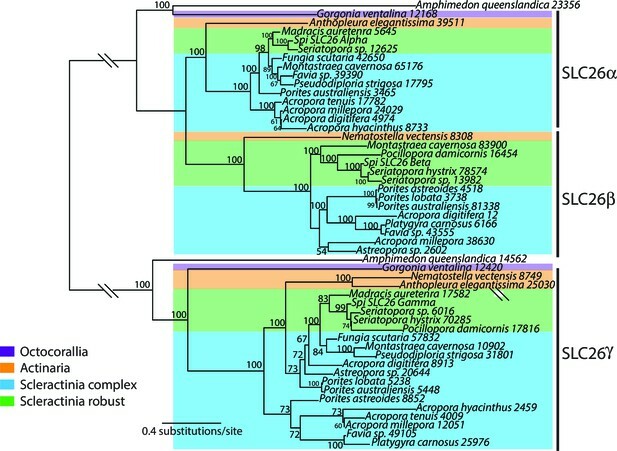 Photosynthetic lineages, regardless of phylogenetic origin, are shown in magenta text and all other taxa are in black text. GenBank accession (GI) or other identifying numbers are shown for each sequence. 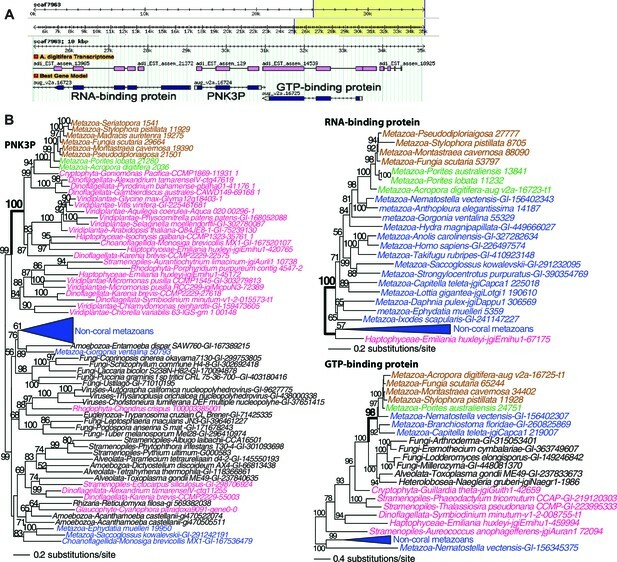 Maximum likelihood tree of an exonuclease-endonucease-phosphatase (EEP) domain-containing protein (A), an ATP-dependent endonuclease (B), a tyrosyl-DNA phosphodiesterase 2-like protein (C), and DNA mismatch repair (MutS-like) protein (D). Robust and complex corals are shown in brown and green text, respectively, and non-coral metazoan and choanoflagellate species are shown in blue text. 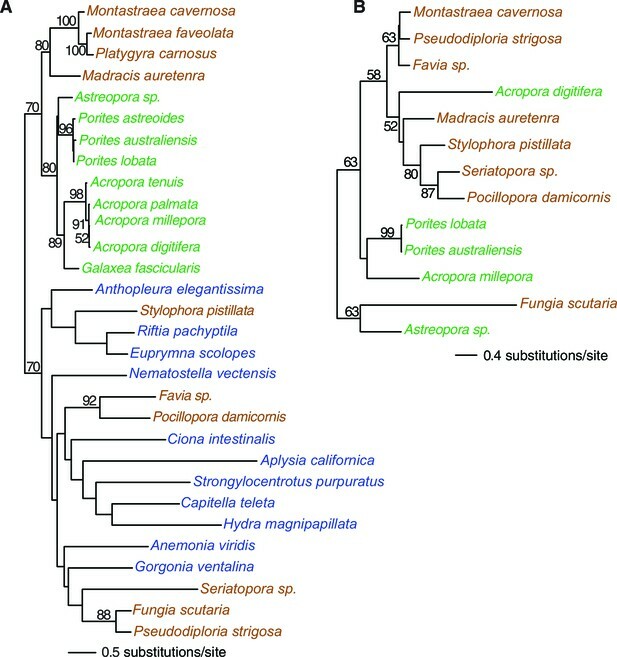 Photosynthetic lineages, regardless of phylogenetic origin, are shown in magenta text and all other taxa are in black text. GenBank accession (GI) or other identifying numbers are shown for each sequence. Maximum likelihood trees of glyoxalase I (or lactoylglutathione lyase) and the proteins encoded by the flanking genes (top image) in Acropora digitifera. 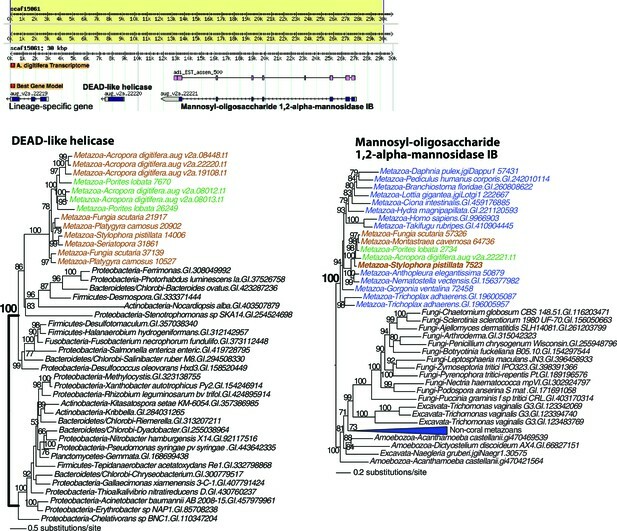 Maximum likelihood tree of a second glyoxalase I (or lactoylglutathione lyase) and the proteins encoded by the flanking genes (top image) in Acropora digitifera. The coral glyoxalase gene gene was derived from a bacteria-specific gene type. 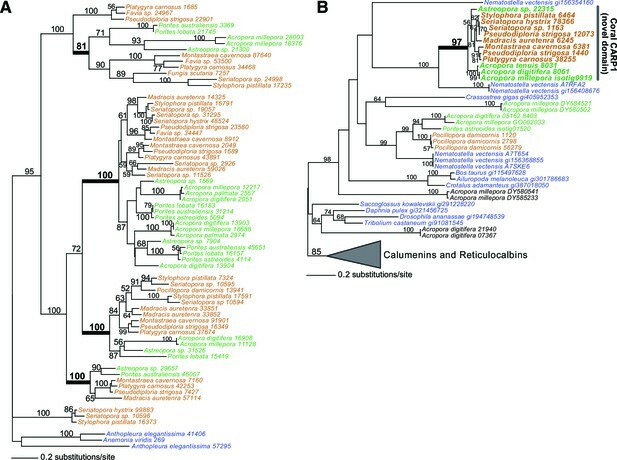 Robust and complex corals are shown in brown and green text, respectively, and non-coral metazoan and choanoflagellate species are shown in blue text. 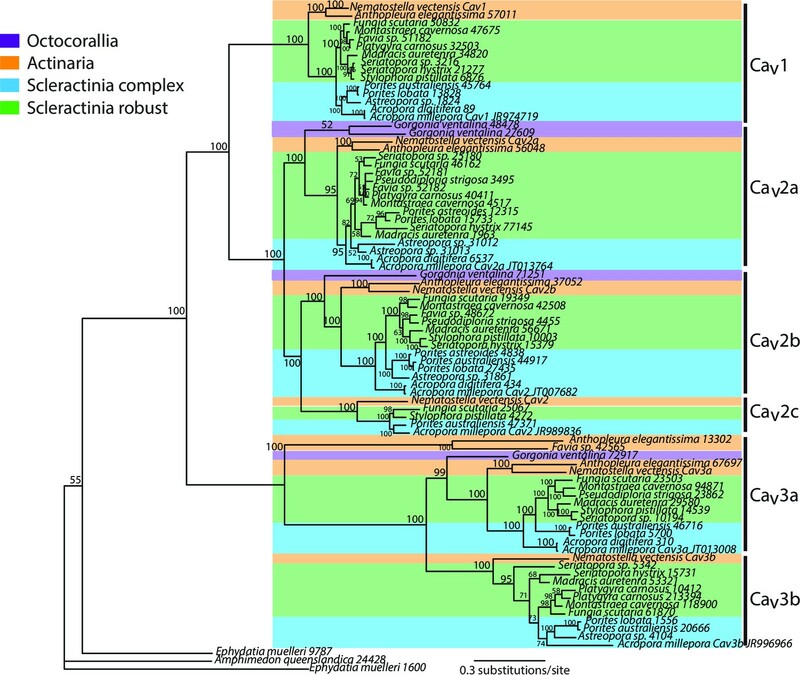 Photosynthetic lineages, regardless of phylogenetic origin, are shown in magenta text and all other taxa are in black text. GenBank accession (GI) or other identifying numbers are shown for each sequence. 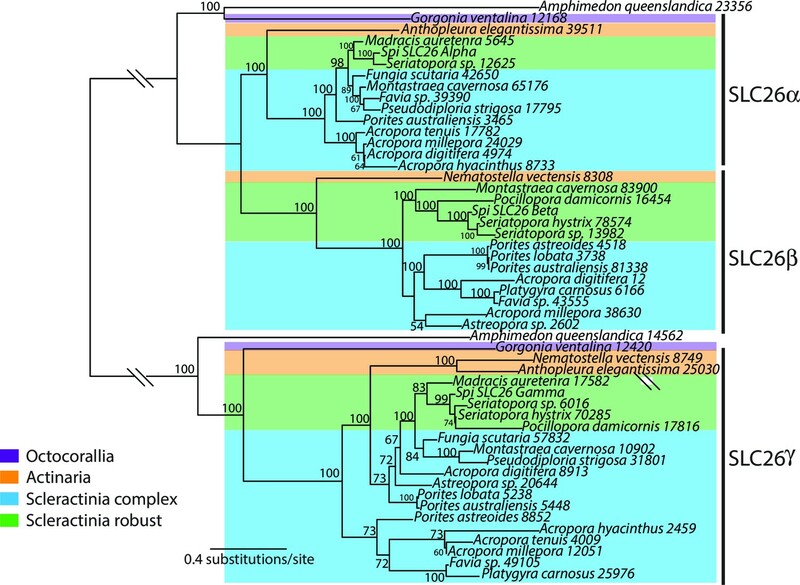 Maximum likelihood tree of an algal-derived short-chain dehydrogenase/reductase (A), and a dinoflagellate-derived phosphonoacetaldehyde hydrolase (B). Publicly available at NCBI Bioproject (accession no. PRJDA67425). Publicly available at NCBI GenBank (accession no. PRJNA177515). Publicly available at NCBI Bioproject (accession no. PRJNA149513). Publicly available at NCBI BioProject (accession no. PRJNA66531). Publicly available at NCBI EST (accession no. FK719875-FK759813). Publicly available at NCBI BioProject (accession no. PRJNA295078). Publicly available at EdwardsiellaBase (Edwardsiella lineata genomics database). Publicly available at NCBI BioProject (accession no. PRJNA176860). Publicly available at NCBI Bioproject (accession no. PRJNA172986). Publicly available at NCBI Bioproject (accession no. PRJNA12876). Publicly available at NCBI Bioproject (accession no. PRJNA64405). Publicly available at NCBI Bioproject (accession no. PRJNA19045). Publicly available at NCBI Bioproject (accession no. PRJNA19965). Publicly available at NCBI Bioproject (accession no. PRJNA230415). Publicly available at NCBI Bioproject (accession no. PRJNA81573). Publicly available at NCBI Bioproject (accession no. PRJNA213480). Publicly available at PocilloporaBase (Pocillopora Transcriptomics Database). Publicly available at NCBI Bioproject (accession no. PRJDB731). Publicly available at NCBI Bioproject (accession no. PRJNA30931). Publicly available at NCBI EST (accession no. DR982333-DR988505). Publicly available at NCBI EST (accession no. EY021828-EY031784). Taxonomic compilation and presence/absence in each taxon for genes involved in oxidative stress, DNA repair, cell cycle and apoptosis. 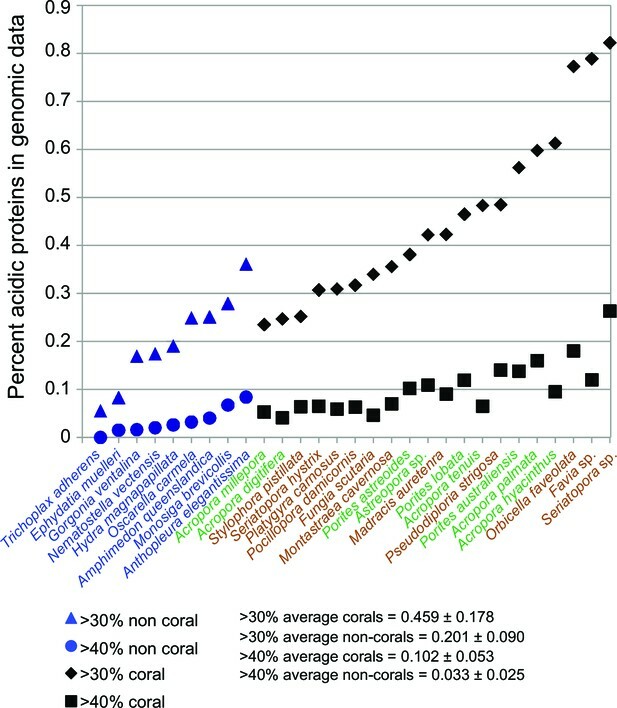 The values in parentheses show the number of taxa in which the gene sequence was recovered in the genomic database.